Seeing is believing. Get to know the layout of Bridgeport Conference Center before you book your event. Our floor plans are up-to-date and reflect the modern design of BCC so you know just what you’re working with. Not enough? Explore the site for photos of events we’ve hosted! The Conference Suites are perfect for smaller meetings and dinner. Each room encompasses about 800 square feet of space that can be divided into two rooms of 400 square feet each. Maximum seating in the 800 square foot area is 35-40 people classroom style. The rental fee includes a six foot screen; LCD projector; and pencils, note pads, water and candies on the tables. (Composed of Meeting Rooms A, B, C and D) Our largest event area is over 4,500 square feet of multi-use space that can be divided into four meeting rooms, offering a variety of set up styles to accommodate any need. Individually each quarter ballroom can be set for 125 – theatre style, 45-classroom style, or 65 – banquet style. The Ballroom can accommodate over 400-theatre style, 236-classroom style, or 300 for a banquet. 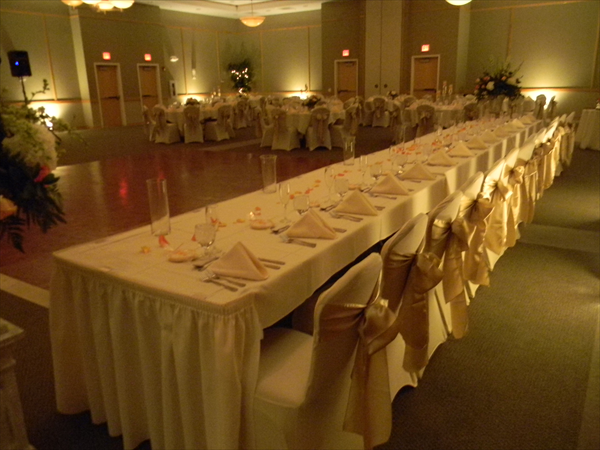 A 1,500 square foot pre-function/lobby area is available for rental in combination with the Ballroom. Outdoor event areas on the courtyard and patio are available for a set up fee of $200.00. When renting an outdoor area, an indoor rain alternate must be rented as well.